Running the Race: I accepted the challenge! 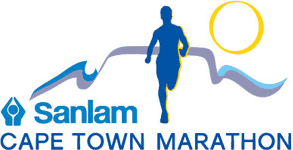 You know by now that six months of running for fun has left me itching for a new challenge, and I'm thrilled to announce that the perfect opportunity has presented itself: The 2015 Sanlam Cape Town Marathon! I have the opportunity to run this IAAF Silver Label status event through the picturesque surroundings of Cape Town on 20 September 2015 (and have access to the post-race VIP area - how jealous are you?! ), and it couldn't have come at a better time. Since completing my first marathon - the Paris Marathon in France in 2011 - I've always been toying with the idea of running another one. And, although I'm by no means the fastest marathon runner out there, I can promise you one thing: I'm a pretty determined one! (Aren't we all?!) So my goal is simple: I want to dip below five hours. My time for the Paris Marathon was 05:01:55 - so near, but so frustratingly impossible for me on race day. So here's my chance. 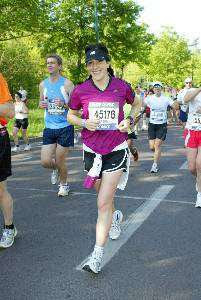 Running the Paris Marathon in 2011. Leading up to September 20th, I'll be bringing you weekly updates on my training, nutrition and gear, and, of course, I'll be sharing all the nitty gritty of the expo, race day and the overall experience with you. Excited? I sure am! I hope so, Gordon...! Thanks so much! Go Karien! I am sure you will run under the 5 hours, good luck on your training. That's so awesome! You're going to do great. Happy training!